Prehistoric Asia refers to events in Asia during the period of human existence prior to the invention of writing systems or the documentation of recorded history. 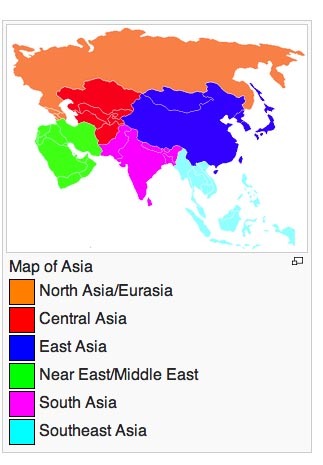 This includes portions of the Eurasian land mass currently or traditionally considered as the continent of Asia. The continent is commonly described as the region east of the Ural Mountains, the Caucasus Mountains, the Caspian Sea and Black Sea, bounded by the Pacific, Indian, and Arctic Oceans. This article gives an overview of the many regions of Asia during prehistoric times. About 1.8 million years ago, some hominids left the African continent. Homo erectus ("upright man") is believed to have lived in East and Southeast Asia from 1.8 million to 40,000 years ago. Their regional distinction is classified as Homo erectus sensu stricto. The females weighed an average of 52 kilograms (115 lb) and were on average 1.5 metres (4.9 ft) tall. The males weighed an average of 58 kilograms (128 lb) and were on average 1.7 metres (5.6 ft) tall. They are believed to have had a vegetarian diet with some meat. They had small brains, when compared to the later Homo sapiens and used simple tools. The earliest human fossils found outside of Africa are skulls and mandibles of the Asian Homo erectus from Dmanisi (modern Republic of Georgia) in Caucasus, which is a land corridor that led to North Asia from Africa and Near East or Middle East. They are approximately 1.8 Ma (Megaannum, or million years) old. Archaeologists have named these fossils Homo erectus georgicus. 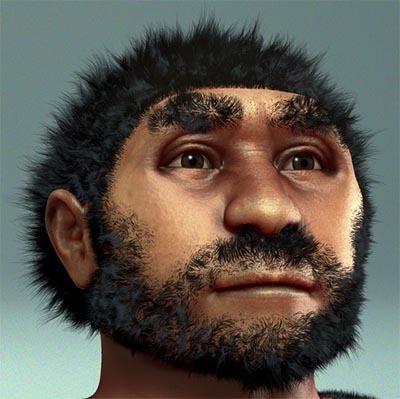 There were also some remains that looked similar to the Homo ergaster, which may mean that there were several species living about that time in Caucasus. Bones of animals found near the human remains included short-necked giraffes, ostriches, ancient rhinoceroses from Africa and saber-toothed tigers and wolves from Eurasia. Tools found with the human fossils include simple stone tools like those used in Africa: a cutting flake, core and a chopper. The oldest Southeast Asian Homo fossils, known as the Homo erectus Java Man, were found between layers of volcanic debris in Java, Indonesia. Fossils representing 40 Homo erectus individuals, known as Peking Man, were found near Beijing at Zhoukoudian that date to about 400,000 years ago. The species was believe to have lived for at least several hundred thousand years in China, and possibly until 200,000 years ago in Indonesia. They may have been the first to use fire and cook food. Two archaeologists are challenging what many experts consider to be the basic assumption of human migration - that humankind arose in Africa and spread over the globe from there. The pair proposes an alternative explanation for human origins: arising in and spreading out of Asia. They believe that early-human fossil discoveries over the past ten years suggest very different conclusions about where humans, or humanlike beings, first walked the Earth. New Asian finds are significant, they say, especially the 1.75 million-year-old small-brained early-human fossils found in Dmanisi, Georgia, and the 18,000-year-old "hobbit" fossils (Homo floresiensis) discovered on the island of Flores in Indonesia. Such finds suggest that Asia's earliest human ancestors may be older by hundreds of thousands of years than previously believed, the scientists say.